Ash Wednesday marks the beginning of the Lenten season. Lent is the 40 days of preparation before Resurrection Sunday. During these 40 days, we observe periods of fasting and prayer, and abstain from sinful pleasures in an effort to draw near our God and prepare to celebrate the amazing redemptive work accomplished through Christ’s atoning death and resurrection. To be clear, the Lord’s day (our Sunday celebrations) are a constant reminder of the truth that the tomb was empty and Jesus lives forevermore declaring those who trust in Him sinless and in right standing with God. But celebrating His Passion and His Resurrection during this time in the Christian calendar allows us to see Him as the mediatorial Son of God, foreshadowed in every sacrifice from the beginning of time. We can clearly see God’s grand design at work as Christ, the paschal lamb, was crucified once for all time. Coupling this time of celebration with a time of preparation allows us a moment to consider where we are in our walk with God and to bring our hearts back to Him. 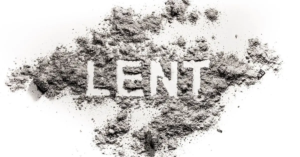 Lent begins with Ash Wednesday. The leaves of Palm Sunday are burned to create the ashes of Ash Wednesday. What’s amazing is Ash Wednesday is a day of mourning over man’s sinfulness, but Palm Sunday was a day of celebration in Jerusalem as the Messiah made His grand entrance on a colt. How befitting that the branches of celebration become the ashes of mourning. As we wear the ashes, we can ask ourselves if our hearts are still passionately pursuing God as they once did. In this, Passion Week and Easter become more than a myriad of service checkboxes on our to-do lists. We prepare our hearts to savor the finished work of our Savior! Take this moment as an opportunity to free up some space in your heart and make room for the crucified, risen, and ascended Lord to again take up residence in your heart. Use this as a time to turn from sin and turn toward God (repent), and to be reminded that we came from dust and we will return to the dust! Let’s journey together – Read our Lent Devotional!